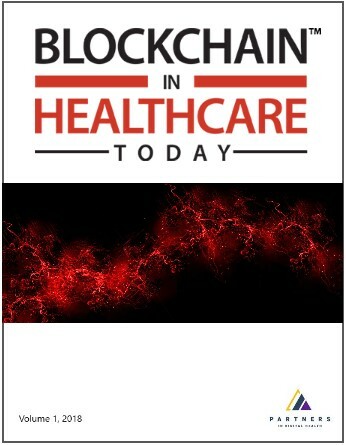 There are several areas of healthcare and well-being that could be enhanced using blockchain technologies. These include device tracking, clinical trials, pharmaceutical tracing, and health insurance. Within device tracking, hospitals can trace their asset within a blockchain infrastructure, including through the complete lifecycle of a device. The information gathered can then be used to improve patient safety and provide after-market analysis to improve efficiency savings. This paper outlines recent work within the areas of pharmaceutical traceability, data sharing, clinical trials, and device tracking. His current work focuses on the secret share methods , and especially in how documents can be stored securely in public cloud based systems. The current cryptography work around secret shares has won several awards, and is the basis for new funded work. This is further enhanced with work around sticky policies and identity based encryption , and which aims to integrate access rights on document within public cloud systems. This includes the storage of high risk documents, such as health care records and financial information. Along with this he has new research work which integrates machine learning into insider threat detection, and within side channel analysis on embedded systems . Bill’s work around information sharing models for trust and governance, which was funded through two EPSRC grants, is now showing significant impact with the integration of over 7,000 health and social care entities within London, and which will be able to share information in a secure and trusted way . • Creator of three successful spin-out companies: Zonefox, Symphonic Software and Cyan Forensics. • Four US/World patents in Cyber Security. • Invited keynote speaker at many conferences, including IEEE e-Health 2016 (on information sharing in health care). • Part of editorial team for a range of international conferences. • Editor-in-Chief, Journal of Cyber Security Technology. • Editor of Cyber Security Series for River Publishers. • Winner, Innovation of the Year, Knowledge Exchange Awards, 2016. • Top 50 people in HE in social media. This social media activity mainly relates to Cyber Security. • Fellow of IET and BCS. • Winner, Scottish Cyber Evangelist of the Year, 2016. • Top 50 Scottish Tech People Who Are Changing The World, FutureScot, 2016. • PhD Examiner for a wide range of universities, including Royal Holloway, Cranfield University and University of Plymouth, along with being a PhD examiner for a number of European universities. • External Examiner for a number of universities, including recent ones with Royal Holloway and Dublin City University. Bill has one of the most extensive academic sites in the World (http://asecuritysite.com), and is involved in many areas of novel research and teaching in cryptography and cyber security. He has published over 27 academic books, and over 250 academic research papers, along with several awards for excellence in research, innovation and teaching. E. Ukwandu, W. J. Buchanan, L. Fan, G. Russell, and O. Lo, “RESCUE: Resilient secret sharing cloud-based architecture,” in Proceedings - 14th IEEE International Conference on Trust, Security and Privacy in Computing and Communications, TrustCom 2015, 2015, vol. 1, pp. 872–879. W. Buchanan, D. Lanc, E. Ukwandu‎, L. Fan, and G. and, “The Future Internet: A World of Secret Shares,” Futur. Internet, vol. 7, no. 4, pp. 445–464, 2015. G. Spyra, W. J. Buchanan, and E. Ekonomou, “Sticky policy enabled authenticated OOXML,” in 2016 SAI Computing Conference (SAI), 2016, pp. 1118–1122. O. Lo, W. J. Buchanan, and D. Carson, “Power analysis attacks on the AES-128 S-box using differential power analysis (DPA) and correlation power analysis (CPA),” J. Cyber Secur. Technol., pp. 1–20, Sep. 2016. L. Fan, W. Buchanan, C. Thümmler, O. Lo, A. Khedim, O. Uthmani, A. Lawson, and D. Bell, “DACAR platform for eHealth services cloud,” in Proceedings - 2011 IEEE 4th International Conference on Cloud Computing, CLOUD 2011, 2011, pp. 219–226. L. Fan, W. J. Buchanan, O. Lo, C. Thuemmler, A. Lawson, O. Uthmani, E. Ekonomou, and A. S. Khedim, “SPoC: Protecting Patient Privacy for e-Health Services in the Cloud,” Int. Conf. eHealth, Telemedicine, Soc. Med. eTELEMED, no. 4, pp. 98–104, 2012. Owen Lo received a BEng (2010) degree in Computer Networks and Distributed Systems from Edinburgh Napier University, and, more recently, was also awarded a PhD (2015) degree in health informatics from the same institute. Currently he is a Research Fellow of Centre for Distributed Computing, Networking and Security at Edinburgh Napier University. Owen has contributed to numerous research projects during his time at Edinburgh Napier University including evaluation of a cloud-based e-Health platform (Cloud4Health), implementation of a data governance engine (safi.re), evaluation of an Anonymised, Distributed, e-Commerce Architecture (ADeCA) and development of digital forensic investigation tools (Fragment Finder). His current research area is on side-channel attacks which is a technique used to attack a cryptographic system by monitoring the physical outputs of the system. Additionally, he is involved in the spin-out project named Fragment Finder which aims to develop a suite of digital investigation tools to enable rapid detection of contraband data.